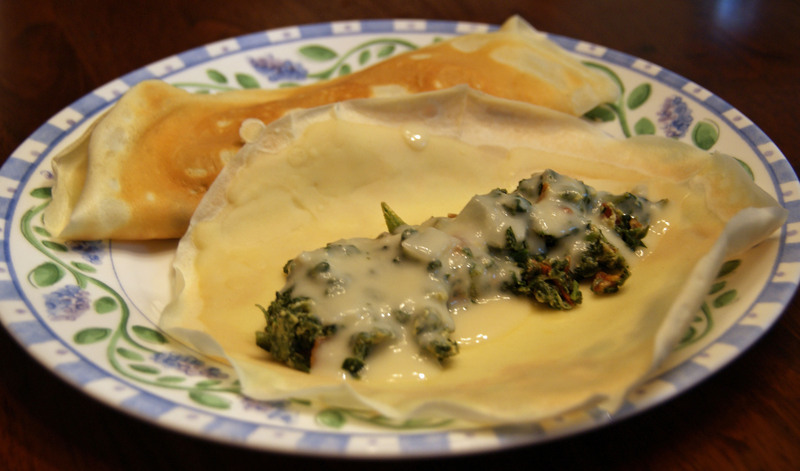 Growing up, my family used to have crepes on Mother’s Day, and then a few random (special?) occasions throughout the year. They were always made with fresh strawberries (or other berries, if available), fresh whipped cream, and brown sugar, and were always breakfast. Since S and I have been married, we’ve expanded crepes to include more savory preparations in addition to the sweet. We recently made some for dinner that were a hodge-podge, spur-of-the-moment thing, but which turned out very well. This is supposed to make about 18, so I halved the recipe since it was only the two of us. Whisk all the ingredients together, then lightly grease and heat (about medium) a skillet. The recipe says to put about 2 Tbsp of batter into the skillet, but my crepes are a bit bigger, so I just use a soup ladle, maybe half to 2/3 full. Your pan should be hot, so when you put the batter in, you’ll need to start tilting right away. Tilt and swirl the batter around the skillet until it stops running. You should have a nice thin, even coat. This may take a little practice if you’re new at it – since I don’t make them that often, I always mess up the first until I find my rhythm again. Still tastes good though. Continue until you’ve used all the batter. While one person is making the crepes (or when you’re finished), prepare the filling. If you look for crepe recipes online, you’ll see that the possibilities are endless – you can have breakfast, lunch, dinner, and dessert crepes, with just about anything inside. This evening, we used an assortment of leftover produce. Quantities are very approximate. Saute the onion until translucent, then add the rest of the ingredients, and cook until the eggs are no longer runny. Basically, you get a frittata that’s all crumbled up. Of course, add anything else you may have lying around – mushrooms would have been good in this one. Finally, make a cream sauce. I don’t really follow recipes for sauces, though S made this one and did use a recipe (but I don’t have it). Basically, melt several tablespoons of butter in a saucepan and add 1/4 cup or so of flour, whisking until mixed well. Add about a cup of milk, continuing to whisk. Throw in a bit of salt/pepper, and a good amount of shredded or grated cheese, and keep mixing until everything is smooth and starts to thicken up. 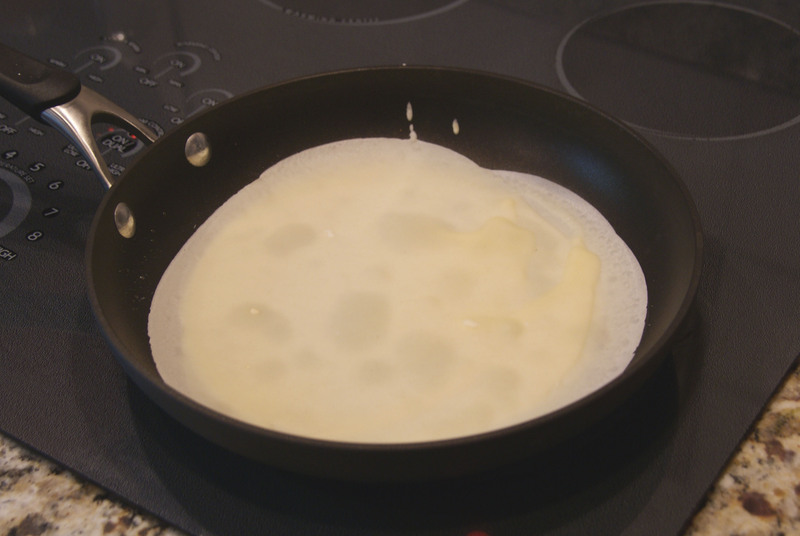 To serve, lay your crepes out flat, spoon some filling into the crepe lengthwise, top with sauce, then fold each side over the top, tucking any excess underneath. If you’re feeling ambitious, spoon some more filling or sauce on the top of the folded crepes as well. These are pretty quick and easy to prepare. The only learning curve may be in cooking the crepes themselves. Enjoy! We eat a lot of buckwheat crepes for breakfast, and sometimes my MiL will make chickpea flour crepes to eat with curried lamb or other Indian food. They’re a good use of non-gluten flours, since they don’t rise at all and don’t need the structure of the gluten.